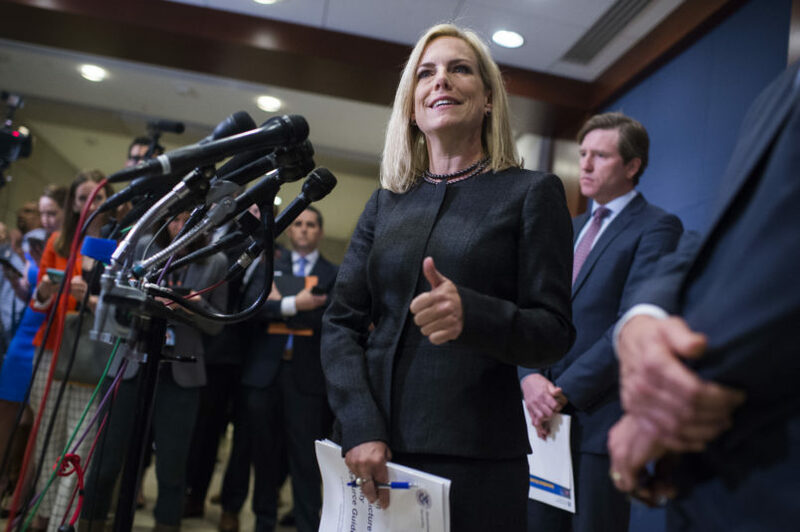 Homeland Security Secretary Kirstjen Nielsen on Tuesday pushed back against a conclusion reached by the intelligence community and the Senate Intelligence Committee — that Russia favored President Donald Trump in its influence campaign during the 2016 election. Speaking to reporters at a House briefing on election security, Nielsen was asked about the 2017 intelligence community report that found Putin not only “ordered an influence campaign” aimed at the 2016 presidential election, but also that Putin had a “clear preference” for Trump in those meddling efforts. She claimed that she hadn’t seen that conclusion, which was made available to the public last year. In a statement to TPM on Tuesday, Department of Homeland Security press secretary Tyler Houlton said that Nielsen “agrees” with the Intelligence Community assessment and “clearly” said Tuesday that the “Russian government unequivocally worked to undermine our democracy” in 2016. Houlton pointed out that the Kremlin “targeted both major political parties” in its interference, but did not state that Nielsen believes Russia favored Trump. Houlton said the language used by the reporter — CNN’s Manu Raju — did not “reflect the specific language” in the intelligence community’s report. “The secretary has previously reviewed the Intelligence Community’s assessment and agrees with it – as she stated today and previously. She also very clearly articulated today that the Russian government unequivocally worked to undermine our democracy during the 2016 election. Russian goals included undermining faith in the U.S. democratic process and harming a candidate’s electability and potential presidency. Importantly, they targeted both major political parties. As the secretary reiterated — their intent was to sow discord in the American electoral process. However, we have no evidence that any ballots were changed or counted incorrectly as a result of Russian interference. “The intelligence assessment language is nuanced for a reason. The secretary agrees with that assessment. But the question asked by the reporter did not reflect the specific language in the assessment itself, so the secretary correctly stated she had not seen the conclusion as characterized by the reporter. Nielsen’s comments come just days after the Senate Intelligence Committee announced it sided with the intelligence community in its findings on Russian interference. Nielsen’s apparent skepticism of the determination that Russia favored Trump is in line with the conclusion reached by Republicans on the House Intelligence Committee. They claimed in their report that the intelligence community didn’t follow its best practices when it concluded Russia favored Trump in the election.